“And when forty years were expired, there appeared to him in the wilderness of Mount Sinai an angel of the Lord in a flame of fire in a bush…saying…I have seen the affliction of my people which is in Egypt, and I have heard their groaning, and am come down to deliver them. And now come, I will send thee into Egypt” (Acts 7:30, 32, 34). That was a long wait in preparation for a great mission. When God delays, He is not inactive. He is getting ready His instruments, He is ripening our powers, and at the appointed moment, we shall arise equal to our task. Even Jesus of Nazareth was thirty years in privacy, growing in wisdom before He began His work. God is never in a hurry but spends years with those He expects to great use. He never thinks the days of preparation too long or too dull. The hardest ingredient in suffering is often time. A short, sharp pang is easily borne, but when a sorrow drags its weary way through long, monotonous years, and day after day returns with the same dull routine of hopeless agony, the heart loses its strength, and without the grace of God, is sure to sink into the very sullenness of despair. Joseph’s was a long trial, and God often has to burn His lessons into the depths of our being by the fires of protracted pain. “He shall sit as a refiner and purifier of silver,” but He knows how long, and like a true goldsmith He stops the fires the moment He sees His image in the glowing metal. We may not see how the outcome of the beautiful plan which God is hiding in the shadow of His hand; it yet may be long concealed; but faith may be sure that He is sitting on the throne, calmly waiting the hour when, with adoring rapture, we shall say, “All things have worked together for good.” Like Joseph, let us be more careful to learn all the lessons in the school of sorrow that we are anxious for the hour of deliverance. There is a “need-be” for every lesson, and when we are ready, our deliverance will surely come, and we shall find that we could not have stood in our place of higher service without the very things that were taught us in the ordeal. God is educating us for the future, for higher service and nobler blessings; and if we have the qualities that fit us for a throne, nothing can keep us from it when God’s time has come. Don’t steal tomorrow out of God’s hands. Give God time to speak to you and reveal His will. He is never too late; learn to wait. 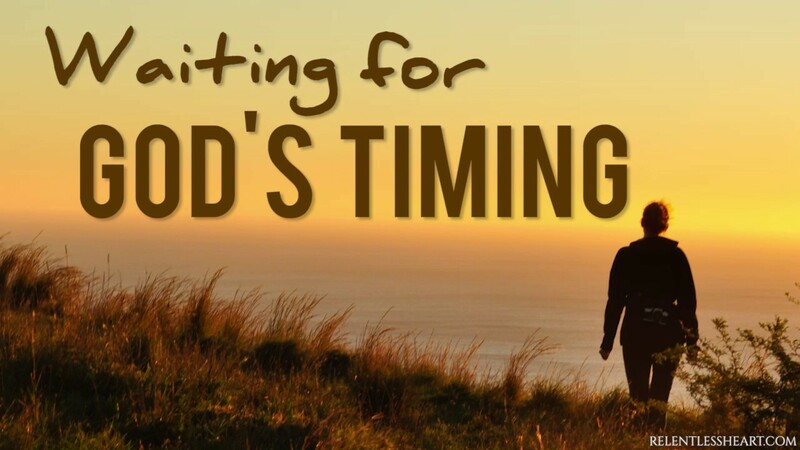 Do not run impetuously before the Lord; learn to wait His time: the minute-hand, as well as the hour-hand, must point the exact moment for action.